IT Best Practices: Employee collaboration across the globe plays a vital role in Intel’s ability to innovate quickly and respond to marketplace opportunities. Over the years, Intel has invested in collaboration technology to increase collaboration, build stronger teams, and enable greater employee productivity. As part of Intel IT’s vision for workplace transformation to support greater innovation, velocity, and openness, we are creating a model for a next-generation conference room. Our new collaboration technology uses manageable, secure hubs a new collaboration software named Intel Unite to enable conference participants to share content and ideas across multiple devices and platforms. 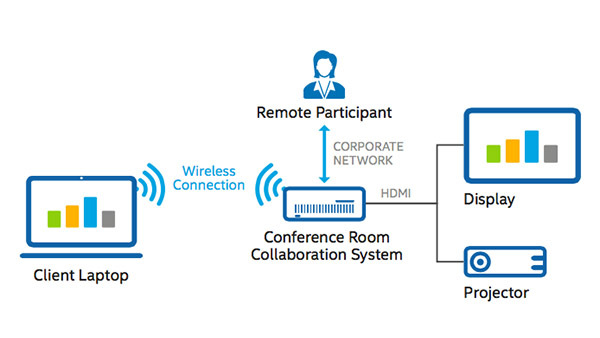 Our solution takes a software-defined infrastructure (SDI) approach, deploying Intel Core vPro processor-based PCs as the hub for in-room and remote collaboration experiences. In its fullest implementation, this solution will enhance global collaboration by bringing data, audio, and videoconferencing together and allowing participants to wirelessly share room resources like displays and multitouch interactive whiteboards. We are already seeing results. Pilot implementations showed a reduction in meeting-start times from two minutes to as little as 15 seconds, and 89 percent of survey respondents said they would recommend the solution to others. Based on this success, we are finalizing our design and planning a gradual rollout worldwide.